1987; Guildhall School of Music and Drama, London, 1990–1993. Career: While at art college worked in a graphic design studio; spent six months in Italy restoring a 12th century villa; joined Young Vic Youth Theatre 1988–1989; two years with Royal Shakespeare Company from 1995. Awards: Broadcast Film Critics' Association, Breakthrough Performer for Elizabeth and Shakespeare in Love , 1999; Chicago Film Critics Association, Most Promising Actor, 1999; Blockbuster Entertainment Awards, Favorite Male Newcomer, 1999. Agent: Ken McReddie Ltd., 91 Regent St., W1R 7TB, London. Interview with Justine Elias in Interview Magazine (New York), February 1999. Interview with Ian Freer in Empire (London), February 1999. "Actor/Shakespearean," interview with Ceri Thomas in Total Film (London), February 2000. Pearlman, Cindy, "Joseph Fiennes' love for acting in the genes," in Chicago Sun-Times (Chicago), 20 December, 1998. Peretz, Evgenia and Herb Ritts, "A Fiennes Debut," in Vanity Fair (New York), 1 January 1999. Grice, Elizabeth, "I don't feel in a hurry," in The Daily Telegraph (London), 10 January 2000. Until he shot to fame in 1998 as the young Will Shakespeare in Shakespeare in Love , Joseph Fiennes was best known as the younger brother of Ralph, who made his impressive big-screen debut in 1993, in Spielberg's Schindler's List. Helped along by Tom Stoppard's clever script, Joseph charmed audiences with his light-hearted and dynamic performance as the love-struck bard, winning nominations for awards from the British Academy of Film and Television Arts and the Screen Actors' Guild. Born in England, but brought up in West Cork, Ireland, Fiennes left school at sixteen and worked for a while as a graphic designer. It was only after a stint helping to restore a villa in Italy that he returned to London in 1988 to join the Young Vic Youth Theatre, and from there secured a place at the Guildhall School of Music and Drama. After graduation, success came quickly: he spent two years with the Royal Shakespeare Company, based in Stratford, England, and made his first TV appearance in The Vacillations of Poppy Carew in 1995. A supporting role in Bertolucci's stylish Stealing Beauty brought Fiennes limited critical success, but in 1998 he struck gold, appearing in three films, two of which were the movie highlights of the year. Elizabeth is a low-budget production filmed almost exclusively in Durham cathedral, England, a setting of vast open spaces and gloomy chambers. Telling the story of the accession of Elizabeth I to the English throne the film is a dark, moody piece of work, essentially a showcase for Blanchett's intense portrayal of the melancholy but triumphant Queen Bess. Playing a supporting role as her banished lover, Robert Dudley, Earl of Leicester, Fiennes measures up well to Blanchett's remarkable performance, which earned her an Oscar nomination. 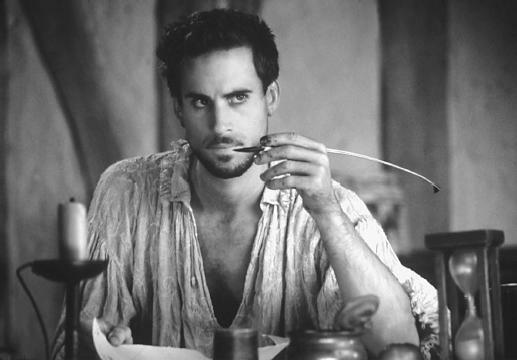 If Elizabeth allowed Fiennes to show his serious side, Shakespeare in Love furnished him with a reputation as a lively comic actor and a teen heartthrob. A tongue-in-cheek reconstruction of the writing of Romeo and Juliet , Shakespeare in Love opens with Will Shakespeare paralysed by writer's block, unable to come up with a title better than "Romeo and Ethel the Pirate's Daughter." Fiennes plays Shakespeare as an earnest but foolish young man, borrowing ideas from other writers, and struggling to keep his creditors happy. It is an image of the playwright quite unlike the serious figure familiar from school and college English courses. The love story between Shakespeare and the aristocratic Viola, played by Oscar winner Gwyneth Paltrow, who must impersonate a male actor in order to be allowed on stage, parallels the story of the star-crossed lovers. She provides the inspiration he needs to finish his manuscript, but the unhappy outcome of their affair leads him to discard its happy ending and make the play a tragedy. Although Fiennes has shown himself to be a versatile actor, Shakespeare in Love remains his most successful work to date, with neither the romantic thriller Forever Mine or Rancid Aluminium making the impact expected of them. Filming of Enemy at the Gates , the most expensive film ever made in Europe began in January 2000. The story of the portentous German attack on Stalingrad at the end of World War Two, the film's makers hope it will be a monument to the dead of both sides. For Fiennes, the project is a long way from Elizabethan England, and a long way from the romantic comedy for which he is best known. It remains to be seen whether he will live up to the promise of Shakespeare in Love. Joseph also played in the movies Dust(2001), Killing me softly(2002), Luther(2003), Man to man(2005), Goodbye Bafana(2005), The Great Raid(2005), The Merchant of Venice(2004), Running with Scissors & so many other great movies!